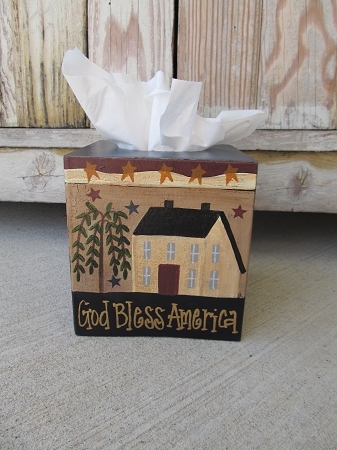 Primitive Americana Patriotic Hand Painted Stars-n-Stripes Tissue Box Cover. I personally love to cover up those tissue boxes and have them match my decor. I've painted up a variety of tissue box covers to accommodate every season! This one shows off your true Patriotic spirit! Coordinates with my other Stars N Stripes themed decor. Paper mache tissue covers have been sealed in a matte finish. Hand painted with an crackled background with an antique finish and edges are distressed. Fits boutique style tissue boxes. Size is 5"x5"x5 1/2". Customize yours with the side color preference and saying choice. Shown here with Traditional Navy Blue on sides/top. Hand painted, designed and signed by Heidi.